Maxell Holdings, Ltd. (マクセルホールディングス株式会社, Makuseru Kabushiki-gaisha), commonly known as Maxell, is a Japanese company that manufactures consumer electronics. The company's name is a contraction of "maximum capacity dry cell". Its notable products are batteries, wireless charging solutions, storage devices, computer tapes, professional broadcast tapes and functional materials. In the past, the company manufactured recording media, including audio cassettes and blank VHS tapes, and recordable optical discs including CD-R/RW and DVD±RW. On March 4, 2008, Maxell announced that they would outsource the manufacturing of their optical media. Maxell was formed in 1960, when a dry cell manufacturing plant was created at the company's headquarters in Ibaraki, Osaka. In 1961, Maxell Electric Industrial Company, Limited was created out of the dry battery and magnetic tape divisions of Nitto Electric Industrial Company, Limited (now Nitto Denko Corporation). On March 18, 2014, the company was listed on the First Section of the Tokyo Stock Exchange. Hitachi Maxell, along with Nagasaki University, NIAIST, and Fuji Heavy Industries (the parent company of Subaru, makers of the R1e electric car), has developed a new chemistry for lithium-ion batteries. Part of the change is dropping the expensive cobalt element and using "nano infused lithium" with manganese, with twenty times more power storage, and the ability to mass produce it inexpensively. During the height of the Compact Audio Cassette's popularity, Maxell's audio cassettes were held in high regard, producing some of the finest examples of the standard available. The performance of the XLII-S (CrO2) and MX (pure metal particles) cassettes was regarded by many audiophiles to be the ultimate achievement in the pre digital domestic recording medium. Maxell audio cassettes are available in 46, 60, 90, 100, 120 and 150 minute lengths. 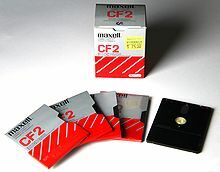 Maxell also produced floppy disks in the unusual 3" format, which came to be used in computers such as the Amstrad CPC line. Compared to 3.5" floppies, they are thicker and the metal cover protecting the disk is inside the plastic casing, not outside. Typical data carrying capacity was about 180 kB on each side. Apart from Amstrad's other 3" machines (the PCW and the ZX Spectrum +3), the few other computer systems to use these disks included the Sega SF-7000 and CP/M systems such as the Tatung Einstein and Osborne machines. They also found use on embedded systems. The 3" disks themselves were usually known as "discs" on the CPC, following the spelling on the machine's plastic casing and conventional non American spelling: "disks". Maxell AirStash is a Wi-Fi storage device (AP mode, so no router required) that operates via an SD card inserted into the device's interior and ultimately determines storage capacity (up to 2 TB). In the 1980s, Maxell became an icon of pop culture when it produced advertisements popularly known as "Blown Away Guy" for its line of audio cassettes. The original campaign conceived by Art Director Lars Anderson began as a two page spread in Rolling Stone Magazine ad in 1980, and was made into television spots in 1981 which ran throughout the 1980s. Steve Steigman was the photographer and Richard Wagner's "Ride of the Valkyries" was used for music. In the United Kingdom, the music used was "Night on Bald Mountain" by Modest Mussorgsky. Maxell "Blown Away Guy" advertisement for cassette tapes. The adverts depict a man sitting low in a (Le Corbusier Grand Confort LC2) high armed chair (on the right side of the screen) in front of, and facing, a JBL L100 speaker (the left side of the screen). His hair and necktie, along with the lampshade to the man's right and the martini glass on the low table to the man's left, are being blown back by the tremendous sound from speakers in front of him — supposedly due to the audio accuracy of Maxell's product. He is shown desperately clinging to the armrests but defiantly looking ahead at the source of the music through sunglasses, though calmly catching his drink before it slides off the end table. Television commercials showed the chair, a drink and nearby lamp, being pushed away from the stereo by the strong force of the sound waves. The image became the de facto standard of those who believed their stereo equipment had sufficient power or accuracy to move the mind and the soul. The model for the United Kingdom (not United States) advert campaign was musician Peter Murphy of the group Bauhaus. The model for the campaign for the United States, however, was the makeup artist Jac Colello, hired for the shoot by photographer Steve Steigman. The impact of the advertising campaign on popular culture still resonates today: "Blown Away Guy" was recently parodied on the popular animated television show Family Guy in the episode "Model Misbehavior". This is only the most recent in countless parodies over the years, which includes a parody in the John Ritter film Stay Tuned, (which featured a character's head being blown off by a "Max-Hell" tape). In the movie Jackass 3D, the commercial is parodied with Ryan Dunn sitting in the chair, while the blast from a jet engine sends the set blowing away. 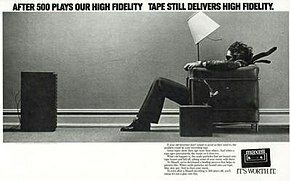 The original soundtrack of the first television advert read, "After 500 plays, Maxell still delivers high fidelity". This durability and quality message did not have the staying power of the "blown away" image, which still lives today. On December 12, 2005, Maxell decided to bring "Blown Away Guy" back due to its popularity. As Maxell now makes blank DVDs and CDs, headphones, speakers, and blank audio and video tape, the ads have been updated with photos of iPods and accessories underneath the image. "Get blown away" is the headline while copy urges consumers to use Maxell accessories to "make your small iPod sound like a huge audio system". The music video for P. Diddy's song "Tell Me", is somewhat reminiscent of the "Blown Away Guy" advertisement. ^ "Corporate Data" (in Japanese). Retrieved March 23, 2014. ^ "Corporate Profile". Google Finance. Retrieved March 23, 2014. ^ "Hitachi Maxell To List On Tokyo Bourse In $750M IPO". The Wall Street Journal. February 14, 2014. Retrieved March 23, 2014. ^ "Company Profile". Retrieved March 23, 2014. ^ "Hitachi Maxell Announces Listing on First Section of Tokyo Stock Exchange" (PDF). March 18, 2014. Archived from the original (PDF) on March 23, 2014. Retrieved March 23, 2014. ^ Colman, David (30 May 2004). "POSSESSED; Designer, Recumbent". New York Times. Retrieved 5 April 2014. ^ Elliot, Stuart (July 5, 2006). "The 'Blow-Away Guy' Rides Again". The New York Times. Retrieved May 4, 2010. Wikimedia Commons has media related to Hitachi Maxell.